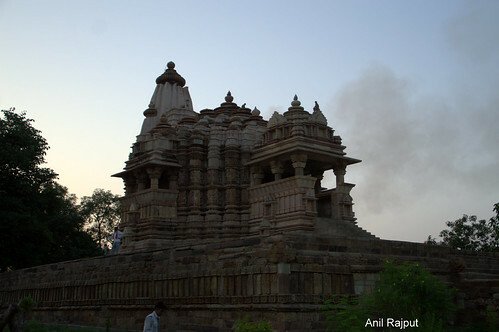 Chitragupta Temple dedicated to Sun God was built during the 1023 AD by the Chandela Rulers , built near the three storied Step well Chopra tank which is also a part of this spectacular temple , is the only Sun temple at Khajuraho . 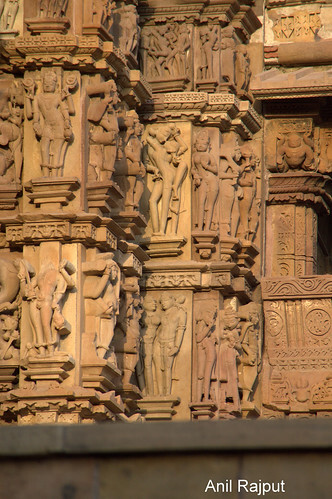 Chitragupta temple faces East, and its cell contains a 5-foot-tall image of Surya wearing an Armored Coat and long Boots complete with the chariot and seven horses that carry him across the sky. Surya also appears above the doorway. 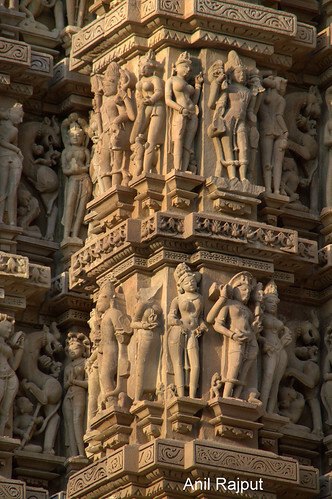 The entrance of the temple portrays three smaller idols of Sun God ,walls decorated with Apsaras in dancing poses, couples in sensuous moments and a impressive images of Lord Vishnu with 11 heads , his own face is in the center and the other heads represent his 10 main incarnations. The vast majority of arts depict various aspects the everyday life, mythical stories as well as symbolic display of various secular and spiritual values important in Sanantan way of Life traditional way . depictions show women putting on makeup, musicians making music, potters, farmers, and other folks in their daily life during that period .